ALFM Funds Total Net Asset Value stands at more than P96 billion as of December 2015. These funds comprise 41% market share of the total mutual funds industry. ALFM Mutual Funds consists of six(6) funds, each having an own investment objective to suit and meet the needs of investors. ALFM Mutual Funds allows you to diversify at a low cost. With the help of BPI ExpressOnline, you can access your ALFM investment account anytime, anywhere. The Regular Subscription Plan simplifies the process of investing by allowing an investor to program his subscriptions so that he can invest on a periodic basis, either on a monthly or quarterly basis. For years, the ALFM Mutual Funds have consistently provided its investors with above benchmark risk-adjusted returns. A Mutual Fund is an open end investment company registered with the Securities andExchange Commission (SEC) in which the investible cash of numerous investors are pooled ina specific fund ("fund") with the aim of achieving a specific investment objective. The Fund isNOT a DEPOSIT product and is not an obligation of, or guaranteed, or insured by the FundManager, and is not insured by the Philippine Deposit Insurance Corporation (PDIC). Due to thenature of the investments, yield and potential yields cannot be guaranteed. Historical performance, when presented, is purely for reference purposes and is not a guarantee of future results. Copyright 2015 © BPI Investment Management Inc. The ALFM Money Market Fund is best suited to investors with a conservative risk profile, or investors who are looking for short term investment outlets where they could temporarily park their investible funds. The ALFM Money Market Fund was incorporated on October 19, 2009 as an alternative investment outlet for short term placements. The Fund aims to achieve preservation of capital and stable income by investing in a diversified portfolio of Philippine Peso denominated short-term fixed income and money market instruments. Management and Advisory Fee 0.50% p.a. The ALFM Peso Bond Fund is ideal for investors who are looking for a well diversified fixed-income investment fund which has consistently provided superior risk-adjusted returns over the medium to long term. The Fund is the only mutual fund in the country which gives a free group term life insurance coverage of PhP200,000.00* to each eligible primary individual investor. The ALFM Peso Bond Fund is the largest mutual fund in the Philippines. It has consistently provided superior returns to its investors since it was launched. It was originally incorporated as Ayala Life Filipino Income Fund, Inc. on July 18, 1997 and was renamed to Ayala Life Fixed Income Fund, Inc. on August 21, 1998. The SEC approved the change to its present name of ALFM Peso Bond Fund, Inc. on February 26, 2007. Over the years, ALFM Peso has grown to become the market leader and the most popular mutual fund in the country. The Fund aims to achieve a steady stream of income by investing in a diversified portfolio of Philippine Peso denominated high-grade fixed income instruments, such as but not limited to, government securities, corporate notes and bonds, and fixed income funds. Management and Advisory Fee 1.00% p.a. The ALFM Euro Bond Fund is the first Euro currency incorporated fund in the country. The Fund was incorporated on August 5, 2005 to engage primarily in the business of investing, reinvesting, and trading of securities and to operate as an open-end investment company. The ALFM Euro Bond Fund is ideal for investors who want attractive returns for their Euro funds. The Fund aims to achieve capital preservation through a steady stream of income by investing in a diversified portfolio of fixed income instruments issued by foreign and local entities, such as but not limited to, Euro-denominated government securities, corporate notes and bonds, and fixed income funds. Management and Advisory Fee 0.75% p.a. The ALFM Growth Fund is best suited to investors who seek long term capital growth, or investors who want to invest in equities and fixed income instruments but have neither the time nor the expertise to make investment decisions. The ALFM Growth Fund was incorporated on November 26, 2007 and is classified under the equity fund segment of the mutual fund industry. The Fund aims to achieve long-term capital appreciation by investing in a diversified portfolio of equities and fixed income instruments. The Fund shall invest at least 90% of its net assets in equity securities under normal market conditions. Management and Advisory Fee 2.00% p.a. Fund, Inc. on October 23, 1993, and was created to engage primarily in the business of investing, reinvesting, and trading of securities, and to operate as an open-end investment company. The Fund commenced operations on May 10, 1999. The SEC approved the change in name to Far East Dollar Bond Fund on Dec. 12, 2001 and to ALFM Dollar Bond Fund on Jan. 21, 2004. The ALFM Dollar Bond Fund is suitable to investors who are looking for consistently attractive returns for their US Dollar funds over the medium to long term. The Fund aims to achieve capital preservation through a steady stream of income by investing in a diversified portfolio of fixed income instruments issued by foreign and local entities, such as but not limited to, US dollar-denominated government securities, corporate notes and bonds, and fixed income funds. 3-month U.S. T-Bill plus 1%, net of tax. Management and Advisory Fee 1.25% p.a. The PSIF is suitable to investors who seek long term capital growth, or those who want to track the performance of the PSEi. The Philippine Stock Index Fund ("PSIF") was incorporated on December 11, 2002 as an open end investment company. The Fund was created as an index tracker fund of the Philippine Stock Exchange Composite Index (PSEi). To date, it is the only index tracker mutual fund that fully replicates the PSEi. The Fund aims to track the performance of the Philippine Stock Exchange Composite Index (PSEi). The fund shall invest substantially all of the Fund's assets in the stocks comprising the PSEi in the same weights as in the index. Philippine Stock Exchange Composite Index (PSEi). This calculator does not guarantee the accuracy of the computed yield of your investment. The computed Return on Investment (ROI) and market value may differ relative to your actual ROI. This calculator will only give the indicative yield of your investment. Fees and rounding-off rules are just some factors that may affect the actual results of your investments. ALFM Mutual Funds consists of six (6) funds, each having an own investment objective to suit and meet the needs of investors. ALFM Mutual Funds allows you to diversity at a low cost. ALFM Mutual Funds pools the money of numerous investors in order to provide them with instant diversification and asset allocation without the high costs needed to create individual portfolios. The various ALFM Funds allow clients to diversify and to spread risks across different asset classes and multi-currencies. The Regular Subscription Plan (RSP) feature allows an investor to make scheduled contributions on a periodic basis, either on a monthly or quarterly basis, permitting you to automatically invest in any of the ALFM Mutual Funds. An investor may begin accumulating wealth for his future requirements by enrolling his ALFM investment account in the Regular Subscription Plan. The Regular Subscription Plan is an investment program that allows you to nominate a regular contribution amount for the purchase of shares for your Mutual Fund account on a periodic basis, either on a monthly or quarterly basis. To learn more about the RSP, click here.For a step-by-step guide on how to enroll your account in the RSP, click here. I hereby authorize BPI Investment Management, Inc. to (i) use any contact details to communicate to me for whatever purpose; (ii) disclose any information herein provided to any person or entity. For this purpose, I agree to indemnify and hold BPI Investment Management, Inc. free and harmless from any and all claims, liabilities, damages, suits or causes of action of whatever nature, now or hereafter arising from or in connection with the foregoing authorization. Step 1: Take the Client Suitability Assessment (CSA). The test is purely for risk classification purposes and will take five (5) minutes to complete. Step 2: Fill out the Client Information Sheet. Step 3: Our Mutual Funds Sales Agent will contact you for a free financial consultation. I here by authorize BPI Investment Management, Inc. to (i) use any contact details to communicate to me for whatever purpose; (ii) disclose any information herein provided to any person or entity. For this purpose, I agree to indemnify and hold BPI Investment Management, Inc. free and harmless from any and all claims, liabilities, damages, suits or causes of action of whatever nature, now or hereafter arising from or in connection with the foregoing authorization. Thank you for your interest in the ALFM Mutual Funds. Our Mutual Funds Sales Agent will contact you for your free financial consultation. Thank you for your interest in the ALFM Mutual Funds. Our Mutual Funds Sales Agent will contact you. What is a mutual fund and why should I invest in it? Answer: Mutual funds are investment opportunities that give you better returns compared to a bank’s time deposit. Mutual funds can be divided into four distinct types: bond funds, equity funds, balanced funds and money market funds. When you invest in a mutual fund, you get instant diversification for your cash. What’s more, mutual funds require only a minimal investment and the gains you get are tax-exempt. Answer: Just like the old saying “don’t put all your eggs in one basket,” diversity is important so that you take less risk for your finances. By diversifying, your risk is spread out to different investments, allowing you to get potential high returns without taking additional risks. Sounds great! How do I invest in a mutual fund? Answer: Mutual fund shares can be bought through the Certified Investment Solicitors (CIS), which are licensed by the SEC. ALFM Mutual Fund shares are distributed via BPI Investment Management, Inc., BPI Capital Corporation and BPI Securities Corporation. You can buy shares at any BPI or BPI Family Savings Bank branches throughout the country. How do I track my investment? What is the NAVps? Answer: Your investment can be tracked via the Net Asset Value per share (NAVps). The NAVps is the current price of a mutual fund share. It changes daily and is calculated at the end of the trading day. To get the NAVps, the net of the fund’s total assets minus its liabilities is divided to the number of outstanding shares. The NAVps of a mutual fund is based on the current market price of the fund’s assets and liabilities. The valuation used is called Marked-to-market. It measures the fair market value of the fund’s assets and liabilities providing a realistic appraisal of the mutual fund company’s current financial situation. The fair market value of assets changes daily depending on market sentiment. Answer: Each mutual fund is compared to a benchmark to see how it is performing. The objective of the mutual fund is to give better returns than its benchmark. 75% Philippines 30-day Special Savings Rate (net of tax) plus 25% BPI Philippine Government Money Market Index. ALFM Peso Bond Fund 75% of the 91-day Philippine Treasury Bill (net of tax) plus 25% BPI Philippine Government Bond 1-5 Year Index. How do I gain from investing in Mutual Funds? The Fund Manager pools together the amount invested by various investors to form a massive asset base. The Fund Manager then uses the accumulated asset base to buy securities in accordance with the Fund’s investment objectives. For Fixed Income investments, the Fund earns periodic interest payments until maturity. For Equity investments, the Fund’s NAVPS appreciation/depreciation is dependent on the performance of its underlying stock / equity holdings. Investments, therefore, in Mutual Funds are valued at their prevailing market performance. Returns are not guaranteed and capital preservation is not assured. How do I open an ALFM Mutual Fund Account? A. Kindly log in to your BPI Express Online account then go to My Portfolio > Open New Accounts > Investments > Mutual Funds. B. Once filled-out, kindly print, completely sign the ONLINE INVESTMENT ACCOUNT APPLICATION form, together with your valid government-issued ID and FATCA FORM. C. Submit the above-mentioned documents, to any BPI or BPI Family Savings Branch (depending on your branch of account) or to BPI Investment Management Inc. at 3/F, Insular Life Building, Ayala Ave. corner Paseo de Roxas St., Makati City, 1226. *ALFM Online Investment Account Applications are only available to single savings/current accounts of BPI and BPI Family. Thus, joint accounts and BPI Direct accounts cannot be nominated as a settlement account. Once you can access your Mutual Fund Investment Account via BPI Express Online account, please go to Investments > Mutual Funds > Subscribe > Subscribe Now as shown below to transact your subscription. However, please be informed that you can only subscribe in an ALFM Fund if your Risk Profile is suitable to the preferred Fund. If ever you do not meet the Risk Profile needed, you may update your Risk Profile by going to Investments > Risk Profile. A. Visit any BPI/BPI Family Savings Branch, together with the co-account holder/s (if any), to initially open an ALFM Investment account. B. Once opened, you may visit any BPI/BPI Family Savings Branch to transact (Subscription/Redemption). 1. For BPI Account Holders, please visit any BPI Branch to transact your Subscriptions/Redemptions. 2. For BPI Family Savings Account Holders, please visit any BPI Family Savings Branch to transact your Subscriptions/Redemptions. To protect principal amount of investments and earn steady stream of interest income. To preserve capital or real value of investments. To achieve growth through a balance between interest income and capital gain over a medium term period. To achieve significant growth or capital appreciation over the medium to long term period. 2. What portion of your investment can be placed in medium or long term investments, i.e., more than 3 years? 3. When and how often do you plan to cash in on your investments? I need to draw regular income from my investments and may use a portion of the principal in the short term. I do not need to draw regular income from my investments nor do I see the immediate need to use any portion of the principal in the short term. I have other sources of liquidity and do not see a real need to use funds for the next 5 to 10 years. I have other sources of liquidity and do not see a real need to use funds for the next 10 years. 4. Whats is your knowledge and experience on investments? Minimal. I know bank deposits, BSP, SDA, T-bills and money market placements. Low. Outside deposits and short term government securities, I have experience investing in money market funds such ascorporate bonds and fixed income bonds. Medium. I have experience investing in mutual funds, UITFs, foreign currencies and direct invesment in listed stock and bonds. High. I have an extensive experience in investing and have a broad understanding of the domestic and global capital markets in general. 5. How many years of experience have you had investing in securities, either directly or through a fund manager? 6. What amount of financial risks are you willing to take when making investments? I am not willing to take any risks on my principal investments and I accept steady and minimal return. I am willing to take minimal risks on my principal investments, and I accept equally minimal returns. I am willing to tolerate a fair amount of risks on my principal investments in order to achieve above average returns and capital growth over the medium term. I am prepared to risk a substantial portion of my principal investment in order to achieve high returns or capital growth over a period of 5 years or more. 7. If the value of your portfolio decreased by 20% in one year, how would you react? I will be very concerned and will immediately put my investment back to cash (i.e. in the form of deposits and/or short term government securities). I will be very concerned and will find safer investment outlets, which are not necessarily cash. I will be concerned and will review the aggressiveness of my portfolio. I will NOT be concerned about the short-term function of certain investments in my portfolio. 8. What is your average net worth for the last 2 years? principal through prevention of loss at all times. An investor who, when faced with two investments with a similar expected return (but different risks), will prefer the one with lower risk. He dislikes risk and would settle for lower but fixed returns. His overriding concern is to protect principal amount of investments and earn a steady stream of interest income. Ready to invest? want to know more? The portfolio seeks to achieve preservation of capital considering the effects of inflation. An investor who seeks a relatively stable return on investment that is slightly higher than traditional term deposit and who is willing to take minor negative fluctuations in returns. Moderately conservative investors usually have to settle for modest investment growth which might make it difficult to meet long-term goals. The portfolio seeks to achieve balance between generating steady income and growth in capital. An investor who seeks a balance between growth in capital and income and who is willing to take negative fluctuations in returns. Moderately aggressive investors want to increase the value of their portfolios while protecting their assets from the risk of minor losses. The portfolio seeks to achieve appreciation of capital over time. Growth and earning the highest returns are the main concerns of this investor. He is willing to take negative fluctuations in return including possible loss of initial investment. 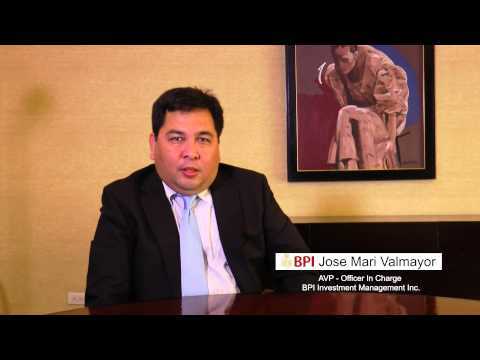 Fund Manager Jose Mari Valmayor discusses opportunities for investing in bond funds. A Mutual Fund is an open end investment company registered with the Securities andExchange Commission (SEC) in which the investible cash of numerous investors are pooled in a specific fund ("fund") with the aim of achieving a specific investment objective. The Fund isNOT a DEPOSIT product and is not an obligation of, or guaranteed, or insured by the FundManager, and is not insured by the Philippine Deposit Insurance Corporation (PDIC). Due to the nature of the investments, yield and potential yields cannot be guaranteed. Historical performance, when presented, is purely for reference purposes and is not a guarantee of future results. Check and compute your returns. Check fund performance trends, calculate Return on Investments, and view the daily price summaries.